Ditch the pen and paper and track your time with a few clicks of a mouse. We’ve integrated a time tracking system into our software that can instantly pull your hours into an invoice. Simply start the clock and we’ll do the rest! To leverage time tracking, simply start tracking hours and choose the client and project that you are working on. If you haven’t set up a client or project yet, you can do so quickly then start allocating hours in that direction! If you accidentally let your timer run too long, or tracked time to the incorrect project, no worries! You can just hop into the time entries and make an easy fix. 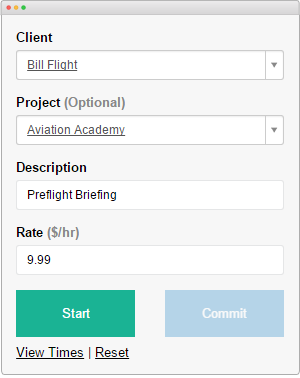 Nobody’s perfect, but Bill Flight’s failsafe time tracking system is darn close!